After Monday’s late afternoon sell off, the SPs spent Tuesday forming a low volume rotation day, trading multiple times on both sides of opening price. All indexes had an inside range to the prior day and the Russell had an NR7 bar. The chart below shows the intraday trend still intact for the Russell, with the hourly charts showing a bull flag. To the upside is a test of all time highs for the Russell. However, a failure to make a full retest up and then penetration of this last swing low would be a “failure test” and would bring in liquidation selling. Until this happens, the trend remains up. Summation tick is neutral. Sentiment readings neutral. Breadth oscillators have been working off overbought readings. Crude is the only market with a Pinball Buy. Wednesday mornings brings the crude inventory reports, sure to lead to good volatility. Lots of markets have breakout coils, but the most interesting is Silver. Outside/Inside range days are one of the more powerful breakout patterns. It also shows up nicely as a low ADX reading on intraday. charts as well. Bonds are well up of their three day lows…any further rally will set up a sell short day – a failure test of the previous swing high would be great trigger. Sugar has had a smart mark up move but closed well off its highs on Monday – Any further morning flush on Tuesday will set up a Buy Scalp. (120 minute bull flag). 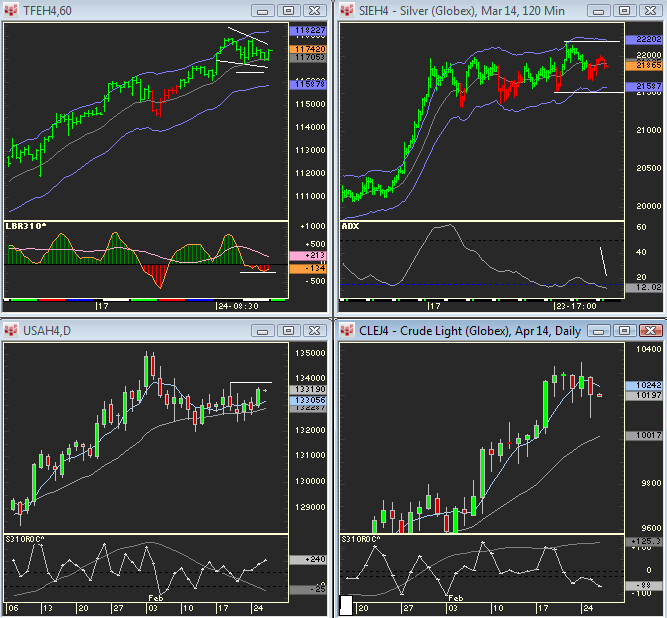 Coffee on the other hand, has Sell Divergences on the 2-period ROC. 168.80 is a previous volume node to the downside. Meats remain the RS leaders to the upside – April cows are poised for an easy push to new 20 days highs. Have a great trading Day – end of the month approaching!